The Chorus set uses a single piece forged aluminum alloy hub shell as the basis of their 130mm long axle, 8 speed Road EXA-DRIVE hubset. The hubs use a combination of loose ball and sealed cartridge bearing construction, using two cartridge bearings in the freehub. The front hub has highly precisely ground steel bearing cups pressed into each side of the hub. Ten 4.75 (.1870") diameter steel ball bearings in each cup. The bearing in the cup are partly closed off by a stamped steel dust cap. This dust cap has a single tiny 1.6mm hole in its outer face. A custom molded Black rubber seal fits around the edge of the dust cap to close the gap between the dust cap and the steel cone race. The tiny hole is the purge hole for spent grease. There is a 2mm diameter hole at the very center of the hub shell over the axle that serves as a grease injection port. This permits grease when pumped in to fill and migrate from the axle center outward forcing old grease through the hole in the dust cap. The steel axle has two precision ground steel cone races. Tiny keyed washers flank the cone race followed by a steel lock nut whose face is serrated for contact with the fork blade. A flat spring cover closes the grease injection hole. The rear hub has what is without a doubt some of the finest bearing design seen yet in a rear hub. There are two sets ball bearing, two sealed cartridge bearings, and a Teflon load bearing washer that operates as a long needle bearing. There are nine 6.35mm diameter steel ball bearings in the non-drive bearing assembly. The non-drive assembly is constructed like those of the front hub, including dust cap, rubber seal, and grease purge port. You may notice the drive side of the hub has an hour glass shape. This stout area of the hub incorporates a bearing set and the steel ratchet ramp set. There are ten 5.55mm diameter steel balls rotating within a steel cup and cone race toward the center of the hub. This establishes a bearing set that carries the load midway across the axle. Toward the freehub body is the steel ramp set, pressed into the alloy hub. With 22 ramps, it takes less than a 6 degree rotation for the three steel hub pawls to engage. The steel freehub body removes as unit exposing all the exceptional design thinking. The interior of the freehub has a SKF #6001-RS1 precision sealed bearing cartridge at each end. Between the two is the Delrin/Teflon insert which carries what little load there may be left un-accounted for among the four bearing sets. A rubber O-ring seals the freehub body to hub shell. There is a grease injection port in the hub shell axle center (with a flat spring closure), and another drilled through the free hub body. The steel lock nut on the drive side is held in place by both lock washer and recessed cap screw. The cone race and lock nut on the non-drive each require a thin, 14mm cone race to work on. The Chorus hubset comes with a pair of steel quick release skewers. 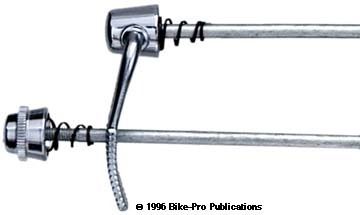 You may remember that Tuillio Campagnolo invented the quick release skewer after a difficult race through the Italian alps in the very early 1900's. It was this idea that launched Campy as a company. 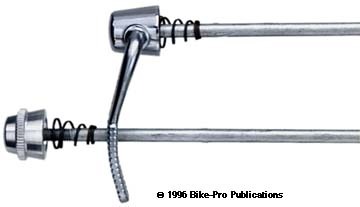 The skewers rely on an internal cam that constricts to close and lock the wheel onto the bike. The lever, cam, cam housing, and adjusting nut are made of chromed steel. The front hub has a 48mm hub flange diameter, with flanges spaced 68mm apart. The front spoke holes have a 38.5mm center circle diameter. The rear hub has a 54mm hub flange diameter, with flanges spaced 54mm apart. The rear spoke holes have a 44mm center circle diameter. With skewer, the front weighs 217.5 grams, (skewer is 77.5 grams), the rear with skewer, and without cogs, weighs 495 grams, (skewer 82 grams). The front hub requires two thin 13mm cone wrenches to work on, because Campagnolo leaves just a 2.75mm access to the cone race and the locknut. For the rear hub, you will need a 14mm cone wrench to hold the cone race, and an adjustable wrench to loosen the drive side locknut. The Chorus hubs have a high polished Silver finish. The hubs are available in 32 or 36 hole drilling, matched the way you want. Please specify hole pattern. The Record hubs are an EXA-DRIVE 8 speed Road hubset, using a 130mm axle, made using a one piece aluminum alloy shell. The hubs use a combination of loose ball and sealed cartridge bearing construction. The front hub has highly precisely ground steel bearing cups pressed into each side of the hub. Nine 5.56mm (.2190") diameter loose steel ball bearings are used in each cup. The hollow steel axle has two precision ground steel cone races. Tiny keyed washers flank each cone race followed by a steel lock nut whose face is serrated for contact with the fork blade. The Record front hub has a forged aluminum dust cap that encloses the cone race and bearing assembly completely. This dust cap snap fits into the inner edge of the bearing cavity, leaving a 1.7mm gap between the edge of the cap the outer face of the hub. Campagnolo makes a special tool to even pull from around the edge, this dust cap off the hub. The tool looks rather like and functions exactly like a wheel puller you might use for your car. We found two flat blade screw drivers pressed on edge slowly from each side performed the same job without marking the hub. There is no real reason for Campy to make the hub this way, and obligate a special tool purchase for routine maintenance. But, what is more, a thick rubber inner washer prevents the grease injection capability this hub was designed with from working. Like the Chorus front, there is a small, 2mm diameter hole over the axle in the middle of the hub intended for grease or oil injection. A flat spring cover closes the grease injection hole. Generally if you have an "in" flow of a material some of the material must be permitted to drain elsewhere, and on the Chorus hub it's an opening in the outer dust cap. The Record's aluminum snap-in dust caps also have the small purge hole found in the Chorus hub, but a rubber seal beneath it (intended to prevent inner contamination) prevents the outbound lubricant from migrating to the cap where it would be wiped away. Since the cap requires a special tool, (or is designed to use one), it defeats easy re- lubrication, and if the bearings or this cap are mis-positioned, the cap spins with the axle increasing drag tremendously. (What was the design team thinking?) The Record front hub also weighs 13 grams more than the Chorus front hub, probably because each of these caps weigh 6 grams. Each of the spoke holes in the outer faces of the front flanges are machine counter-sunk to minimize the stress on the spoke head. Once we had taken the rear freehub apart we discovered it to be nearly identical to the Chorus rear hub. The only known difference is the dust cap on the non-drive side which appears to stainless steel with a nice brushed finish and the rubber around the interior of this cap is smaller. Otherwise the rear hubs seem the same, and in fact the Record weighed just 1/2 gram more (Record 413.5g, Chorus 413g ) than Chorus which is easily explained by a tiny bit more grease in the hub. The Record hubset comes with a pair of steel quick release skewers. The skewers are heavier than the Chorus set because the cam mechanism and its housing are more massive. 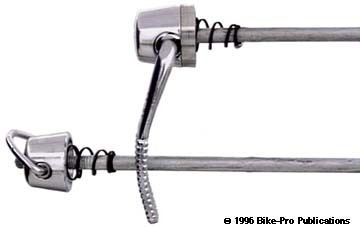 The skewers rely on an internal cam that constricts to close and lock the wheel onto the bike. The adjusting nut uses a traditional D-ring for a finger grip. The front hub has a 48mm hub flange diameter, with flanges spaced 68mm apart. The front spoke holes have a 38.5mm center circle diameter. The rear hub has a 54mm hub flange diameter, with flanges spaced 54mm apart. The rear spoke holes have a 44mm center circle diameter. With skewer, the front weighs 246 grams, (skewer is 9 grams), the rear with skewer, and without cogs, weighs 511 grams, (skewer 98.5 grams). Once you remove the alloy dust cap, the front hub requires two thin 13mm cone wrenches to work on, because Campagnolo leaves just a 2.75mm access to the cone race and the locknut. For the rear hub, you will need a 14mm cone wrench to hold the cone race, and an adjustable wrench to loosen the drive side locknut. Another version of the freehub is available, known as the "Super Record Freehub" it uses a forged and machined aluminum alloy freehub body in place of the steel one that we've seen used in the Chorus and Record rear hub. With skewer, without cogs, it weighs 481.5 grams (skewer 98.5 grams). Campy specified that this hub be used only with their aluminum cogset, the steel set would put undue stress on the aluminum freehub body. The Record hubs have a high polished Silver finish. The hubs are available in 28, 32 or 36 hole drilling, matched the way you want. Please specify hole pattern. The Record OR hubs use a 135mm rear axle length, to make the 8 speed Exa-Drive mountain hubset. The hubs use a one piece aluminum shell construction, with a combination of loose ball and sealed bearing construction. The Record OR front hub is made like the Record. It uses the same bearings and cone races as the Record, and it has the injection hole at the center of the axle. Instead of the press-in aluminum dust caps, it has a stamped steel dust cap with the rubber circumference seal like the one used in the Chorus hub. The rubber seal is different than the Chorus model and completely covers and closes off the hole in the dust cap making the purge function of the hole useless. The spoke holes on the outer flange face are again drilled to countersink the spoke head, minimize the stress on the head. 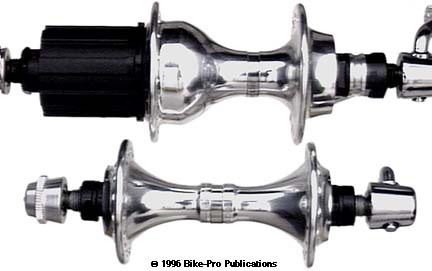 The rear freehub is the same used in the Record hubset, however it has a slightly longer axle for mountain use and the axle is spaced, (using a 4mm longer aluminum spacer), differently in relation to the flanges than the Record. The OR set comes with a pair of quick release skewers that use and internal cam system to constrict and lock the wheel on the bike. The adjusting nut on these skewers is made of machined aluminum alloy having a knurled finger grip, with a plastic inner sleeve that makes it function like a lock nut. The front hub has a 48mm hub flange diameter, with flanges spaced 68mm apart. The front spoke holes have a 38.5mm center circle diameter. The rear hub has a 54mm hub flange diameter, with flanges spaced 54mm apart. The rear spoke holes have a 44mm center circle diameter. With skewer, the front weighs 210.5 grams, (skewer is 66 grams). The freehub with skewer, and without cogs, weighs 485.5 grams, (skewer 70 grams). The front hub requires two thin 13mm cone wrenches to work on, because Campagnolo leaves just a 2.75mm access to the cone race and the locknut. For the rear hub, you will need a 14mm cone wrench to hold the cone race, and an adjustable wrench to loosen the drive side locknut. 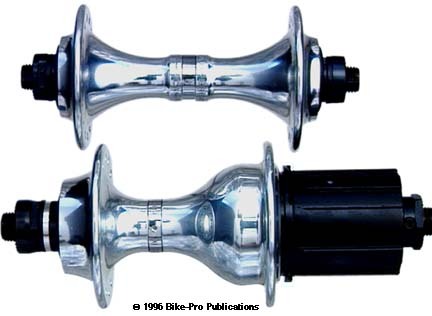 The Record OR group has been discontinued by Campy Availability of these hubs are very un-certain, frankly they always were.